​​​Daynee Heller, 67, had experienced painful pancreatitis attacks before, but this time the timing could not have been worse. It was a few days before Christmas and the last place she wanted to be was in the hospital again. 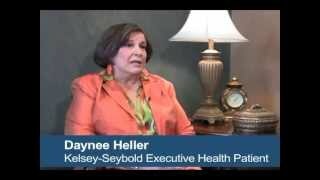 A KelseyCare Advantage member and Executive Health patient, Daynee immediately contacted Executive Health for an appointment. Her regular physician was on holiday, but licensed vocational nurse Conya Mixson personally saw to it that Daynee, who was in a lot of pain, was seen by another Executive Health physician, Dr. Nicholas Solomos​. His creative thinking – and Kelsey-Seybold Infusion Center registered nurse Vilma Sherry – saved her from at least a three or four day hospital stay. ​Typically, the treatment for pancreatitis is hospital admission, where the patient is put on intravenous (IV) fluids and can’t eat or drink. How long the patient stays in the hospital varies. Some people recover quickly and others develop complications that require a longer hospitalization. Instead, her doctor oversaw her care in the Kelsey-Seybold Infusion Center over two consecutive days of treatment, an hour and a half each. “It was like a big Christmas present that somebody would do some creative thinking, rather than just send me to the hospital. I went to the Infusion Center and, sure enough, in two days my enzyme levels were back where they needed to be and I went on my merry way,” Daynee said. It’s the kind of care and attention she and her husband have come to expect from Kelsey-Seybold. “I just see quality all the way around. I tell all my friends about Kelsey-Seybold and the care that my husband and I receive. I know that if something were to happen to us, we’re going to be attended to,” Daynee said. ​​When the National Committee for Quality Assurance named Kelsey-Seybold Clinic as the first accredited Accountable Care Organization in the nation, Daynee considered it to be further validation of the excellent patient care she says she’s been receiving as a longtime patient. “I’ve been totally happy with my provider for 25 years. If I’m noticing excellence and I see that other people are noticing excellence, then that just reinforces my decision to come to Kelsey-Seybold,” she said. ​Daynee appreciates the coordinated care approach that Kelsey-Seybold takes and feels it plays a role in the quality of care she receives. “In the time it took me to walk downstairs from Executive Health to Internal Medicine to see the doctor, he had accessed my Electronic Medical Record, reviewed my history, looked at what had happened during previous pancreatitis attacks and then talked with me with knowledge about what had happened before – which saved a lot of time,” she said.